Last Thursday while I was browsing at meat section in Carrefour, I saw this camel meat…. mmmm what can I do with it? 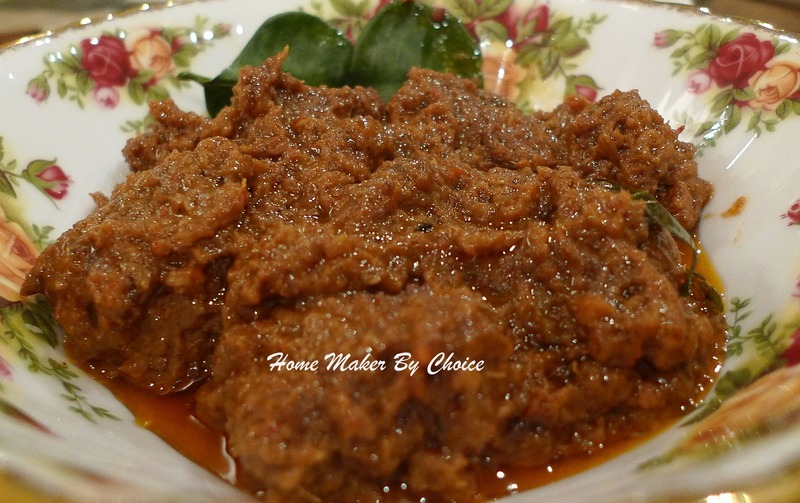 Immediately rendang came across my mind. Bila nak buat tu suku kira, beli dulu apa2 pun. It was about KD2.900 per kg. So after 4 days sitting quietly in my freezer, this morning I decided to give it a try. The taste? Well, the taste is exactly like beef, at least to my taste bud la. Place the meat in saucepan and add about 1 liter of water, cook until the meat is 1/4 cook. Set aside. Grind the coriander, fennel and cummin. Soak dried chillies in hot water until soft. Place soaked dried chilies, small thai chillies, onion, garlic, galangal, ginger and lemongrass into a blender. Blend to a paste. Heat a heavy based pan. Add oil and then fry the paste until fragrant. Add the ground coriander, fennel and cummin and cook for 3 to 4 minutes, stirring continuously. Add the meat and the meat stock; cook over a medium heat until the meat is 1/2 cooked. Stir in salt, sugar, coconut milk, kerisik, asam keping, tumeric leaf and kaffir leaves. Bring to a boil, lower the heat, and simmer until most of the liquid has gone and the meat is cooked (about 1 – 1 1/2 hour). Serve with pulut kuning. Hati (beef liver) from qurban baru2 ni still there in the freezer…I keep on thinking of how can I finish it off coz dah lama sangat kat dalam tu. 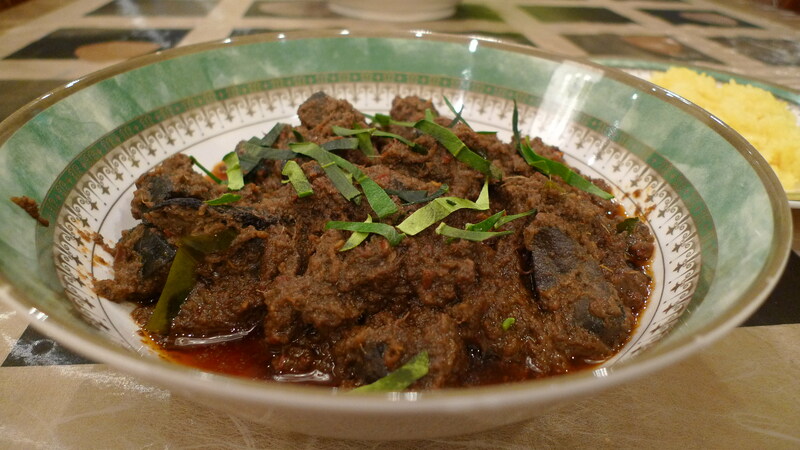 So, since I was a bit “rajin” yesterday, I decided to make rendang out of it. This morning I made pulut kuning to couple with the rendang…but Sofea and Jessy still makan the pulut with serunding and sugar…hmmm typical Kelantanese! Grind the coriander, fennel and cummin. Soak dried chillies in hot water until soft. Place soaked dried chilies, small thai chillies, onion, garlic, galangal, ginger and lemongrass into a blender. Blend to a paste. Heat a heavy based pan. Add oil and then fry the paste until fragrant. Add the ground coriander, fennel and cummin and cook for 3 to 4 minutes, stirring continuously. Add hati (beef liver); cook over a medium heat until the liver is 1/2 cooked. Stir in salt, sugar, coconut milk, kerisik, asam keping, tumeric leaf and kaffir leaves. Bring to a boil, lower the heat, and simmer until most of the liquid has gone and the liver is cooked (about 1 hour).